Des Houghton: One minute Palaszczuk and Shorten seem to be in favour of mining; the next they express grave reservations, as if they are willing the project to fail. What has the Labor Party got against coal? SOONER or later Annastacia Palaszczuk is going to have to explain to Queenslanders exactly where she stands on Adani's Carmichael coal mine - and the others that will follow it. Adani will be exporting quality thermal coal from the Galilee Basin, west of Mackay, within two years. The Premier's refusal to publicly congratulate Adani speaks volumes. Her lines were glib and seemed to me to be deliberately vague. It is as though she was mimicking set words sanctioned by the oily Bill Shorten. One minute Palaszczuk and Shorten seem to be in favour of mining; the next they express grave reservations, as if they are willing the project to fail. We have some of the largest untapped coal reserves on the planet. If Palaszczuk doesn't like it, she will just have to lump it. The Premier has one leg each side of a barbed wire fence. She is wedged between the green left and her own party's "progressives" on one side, and the need for jobs and royalties revenues on the other. In 2016 she gushed over Gautam Adani in Townsville and jumped at the chance to pump his hand in a photo op. Palaszczuk now seems to have repudiated statements she made only last year when she backed the project. Last March she issued a press release headed: "India rise spurs Queensland export growth." 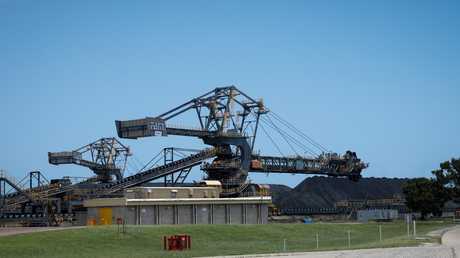 It read: "The Carmichael Coal project promises to provide thousands of direct and indirect jobs in regional Queensland. "As Premier, I am determined to ensure we maximise the benefit of this project for our communities and our state economy." 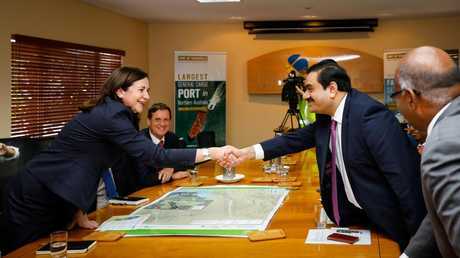 Palaszczuk's support for Adani followed Anna Bligh's lead. 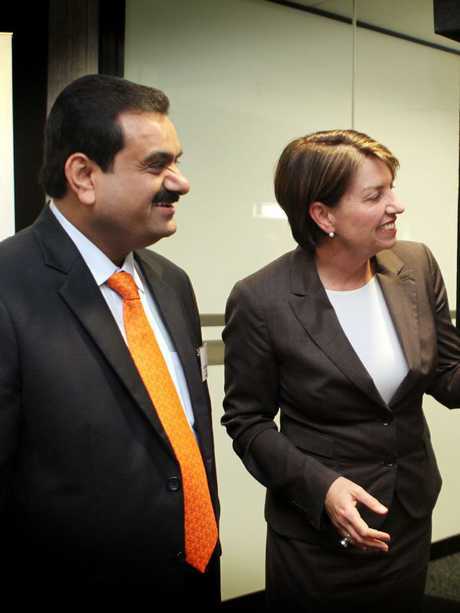 In 2010 premier Bligh sidled up to Adani for a photo when he visited Brisbane to open its Queensland office. Palaszczuk was a member of the Bligh cabinet that declared Carmichael a "significant project". Today Palaszczuk and Shorten are terrified that Labor votes are leaking to the Greens, and they have stepped up the anti-coal rhetoric accordingly. 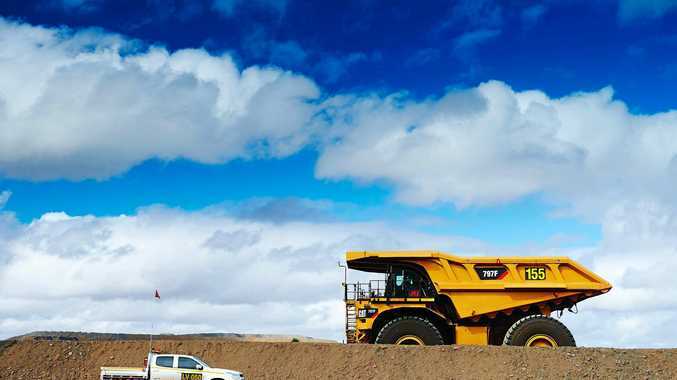 Queensland Resources Council chief Ian Macfarlane says the Carmichael mine, albeit in a scaled-down version, will be the catalyst for up to five other coal mines. Will Palaszczuk also run cold on the proposed $6.7 billion Chinese-backed MacMines coal mine in the Galilee Basin that was approved by her Government last week? Will she pay due respect to Gina Rinehart for risking $6 billion on mines at the Kevin's Corner and Alpha projects in the Galilee, both run by India's GVK. They, too, have received environmental approvals. Clive Palmer, often demonised in the media, should likewise be congratulated for kickstarting his Alpha North mine in the Galilee. Macfarlane says thermal coal is now paying around $11 in royalty taxes for every tonne exported. 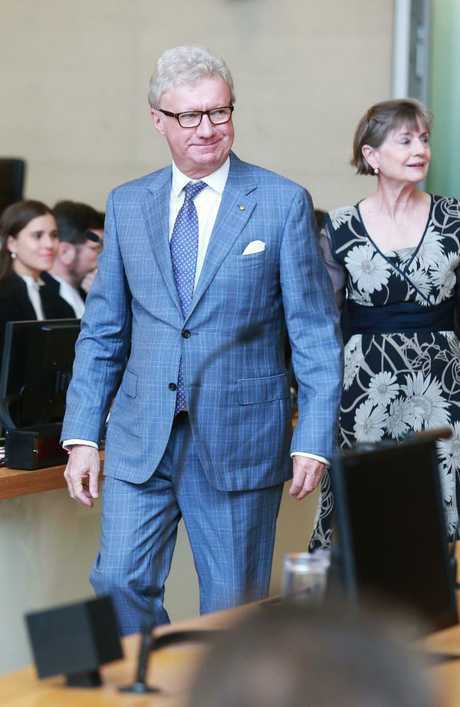 "So at current rates, for every 10 million tonnes of coal exported, Queenslanders receive about $110 million in royalty taxes," he says. "Over the life of mines, this adds up to billions of dollars, even accounting for price fluctuations." India, especially, needs our coal. It plans to build 50 gigawatts of modern High Efficiency, Low Emission (HELE) coal-fired power stations in the next five years. Fossil fuels are expected to earn Australia $100 billion this year. The International Energy Agency has just tallied last year's global coal consumption and noted that demand had risen by 250 million tonnes, more than 3 per cent. The argument from the Greens that the coal industry should be shut down by 2030 makes no sense. The invasion of anti-Adani protesters in State Parliament this week was a disgrace. They should have been arrested and charged. Meanwhile, claims by anti-coal zealots about the potential damage to the Great Barrier Reef and the climate change impacts of the Adani mine must be considered in a global context. The Supreme Court in Queensland has considered both issues and ruled in favour of the company. That said, our regulators must be prepared to enforce the strict environmental conditions placed on coal projects. I liked what the Conservative Party Senate candidate for Queensland, Lyle Shelton, had to say: "Hundreds of High Energy, Low Emission power plants are being built throughout the world and the demand for Queensland coal is only going to increase. "The sad irony is that as Australia's failing electricity grid becomes more unreliable, Asia is burning our coal in modern power plants, yet we have no plans to replace lost base-load electricity here. "If we can burn it there, why can't we burn it here?" How will Palaszczuk and Shorten answer it? WILD deer are emerging as a bigger menace than dingoes in Queensland with warnings they may spread deadly foot-and-mouth disease to the billion-dollar beef herd. 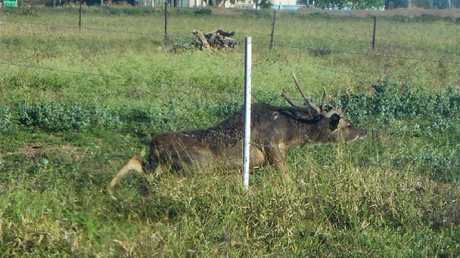 There are at least 30,000 feral deer in Queensland, with landholders saying those numbers are vastly underestimated. As well as carrying contagious diseases and ticks into tick-free cattle zones, the deer are competing with livestock and native animals for pasture. The Centre for Invasive Species Solutions has begun an $8.7 million study to find ways to eradicate and contain the deer. Matt Gentle, a Queensland Government biosecurity zoologist, has joined researchers using drones and thermal imaging to track deer. Toowoomba-based Gentle says as well as the foot-and-mouth threat, wild deer harm agriculture and reforestation programs. The deer trample crops or eat them. They also feast on certain native plants, as well as plants and flowers in parks and gardens. Scientists discovered the animal's agility when they photographed one crawling under a fence. Gentle says wild deer (pictured) pose a growing traffic accident threat in so-called peri-urban areas like Brisbane's western suburbs, the Sunshine Coast hinterland and the Moreton Bay Regional Council area. Deer are in large numbers in the Brisbane Valley, on the Granite Belt and in bush zones west of Longreach, north of Clermont and on the Atherton Tableland. Gentle says the four species causing damage in Queensland are the red deer, the rusa, the chital and the fallow deer. All are introduced. Deer in Queensland are regularly trapped and shot from light planes and helicopters. Scientists attempting to count and track deer herds were this week crawling around in the bush counting deer poo pellets. A Queensland Government report entitled Feral Deer Management Strategy suggests the invasive pest could be a money-spinner. "Landholders may charge fees for access to hunt feral deer, and hunting guides and professional outfitters may generate income by servicing recreational deer hunters," it says. "There are opportunities for professional harvesters to supply the wild venison trade for both human consumption and the pet meat market." This is sensible. Those of us who have shot and eaten deer can attest to its tastiness. GOVERNOR Paul de Jersey invoked the Queensland spirit in an inspiring Christmas speech at Government House on Thursday night. I thought it was one of his best yet. "Through drought, and now fires, our state spirit of resilience and optimism, of care and compassion, is ingrained in our communities," he said. "As Queenslanders we celebrate our success and share our struggles, never too far from a helpful hand. We are bound by a common maroon thread." This year the Christmas reception was held in the grounds of Fernberg against a blaze of lights. The grounds are open to the public nightly, 7-8pm, until December 16. What a year it has been for de Jersey and his wife Kaye. They attended 616 events, 248 of them at Government House. And they made 42 regional tours. That's the Queensland spirit. Charlie Mort of Mort & Co – the Mort name is synonymous with beef. 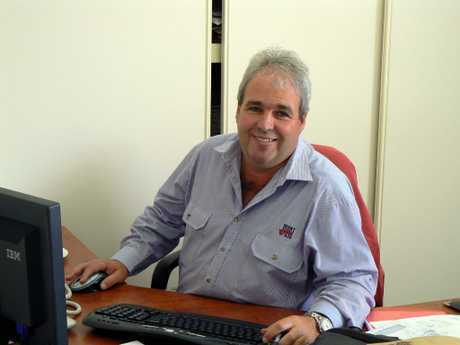 BEEF baron Charlie Mort, whose Grassdale feedlot on the Darling Downs will soon be Australia's largest, has turned the defunct Mort Estate Hotel in Toowoomba into his new headquarters. It means you can address your letters to Charlie Mort, Mort & Co, Mort Estate, 91 Mort St, Toowoomba QLD 4350. The Mort name is synonymous with beef. The Morts established their first cattle run at Grandchester in the Lockyer Valley in 1849. Charlie's great, great uncle - Thomas Sutcliffe Mort - was the founding father of Australian agribusiness and the first man to export refrigerated beef abroad. Mort & Co is on a high after snaring two gold medals earlier this year (best rib-eye, best sirloin) at the World Steak Challenge in London. I CAUGHT up with Charlie Mort at Mick Coorey's Spotted Cow Hotel in Toowoomba this week at the inaugural Darling Downs Beef Battle. I joined a judging panel in a blind tasting. The quality was so good it was a bit like comparing Penfolds Grange with Henschke Hill of Grace and so on. The big guns took part including JBS, Stanbroke, Rangers Valley, NH Foods' Oakey Beef Exports, John Dee, and Mort & Co. The meat was stunning and the overall winner was NH Foods for its Angus Reserve, from 150-day grain-fed cattle. Pat Gleeson from NH Foods tells me the firm slaughters up to 1000 head a day at Oakey, mostly for export to 34 countries. Angus Reserve is also available at Costco. Treasury Brisbane Executive Chef Steven Jones. Steven is holding JBS Beef City Black beef – an Angus Tomahawk steak, and Angus Rib Roast. 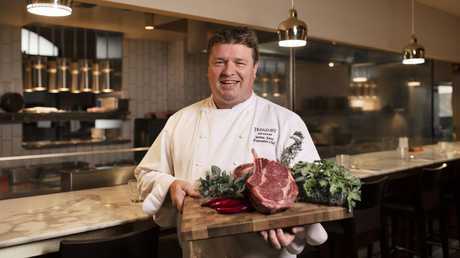 The beef was cooked expertly under the eye of Treasury Casino executive chef Steve Jones (pictured). Points were allotted for flavour, tenderness, juiciness and mouth-feel. The contest was organised by Bruce McConnell from Food Leaders Australia. He says there has been massive growth in beef production on the Darling Downs with 85 per cent of the kill exported. Toowoomba is at the epicentre of the beef trade. Executives of The Star Entertainment Group from Sydney attended the dinner. They are getting set to source high-end beef for Queen's Wharf restaurants and their casinos interstate. 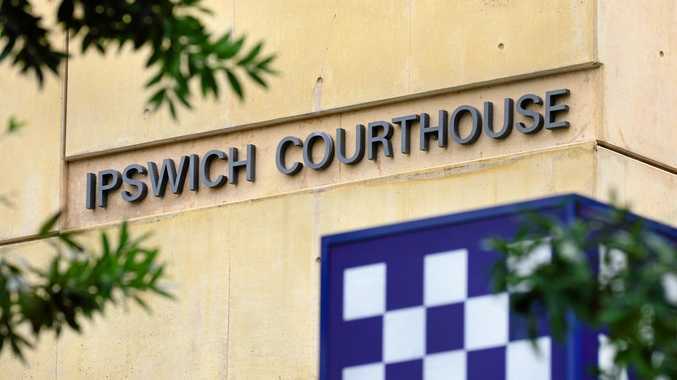 DESPITE paying more than $3 million in legal costs, the construction division of the CFMMEU in Queensland finished the year with a surplus of $1,697,701. Salaries of the union's fat cats were also revealed in the annual report. Branch secretary Michael Ravbar got $208,885; president Royce Kupsch $207,353; and assistant branch secretary Jade Ingham $186,482.